Sheet drawing. 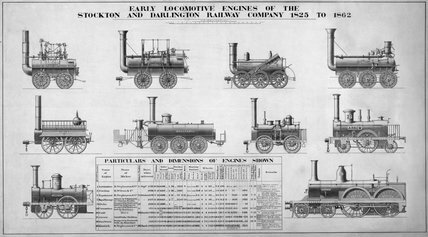 Locomotives featured are: 'Locomotion' (1825), 'Stockton' (1826), 'Experiment' (1826), 'Royal George' (1827), 'Globe' (1830), 'Coronation' (1831), 'Swift' (1836), 'Arrow' (1837), 'Sunbeam' (1837) and 'Keswick' (1862). The Stockton & Darlington was the first public railway to use steam locomotives to haul passengers and goods. Its lines in the north-east of England covered less than thirty miles and were mainly used to transport heavy minerals, particulary coal. The company was taken over by the North Eastern Railway in 1863.